« Do You Want a Date? 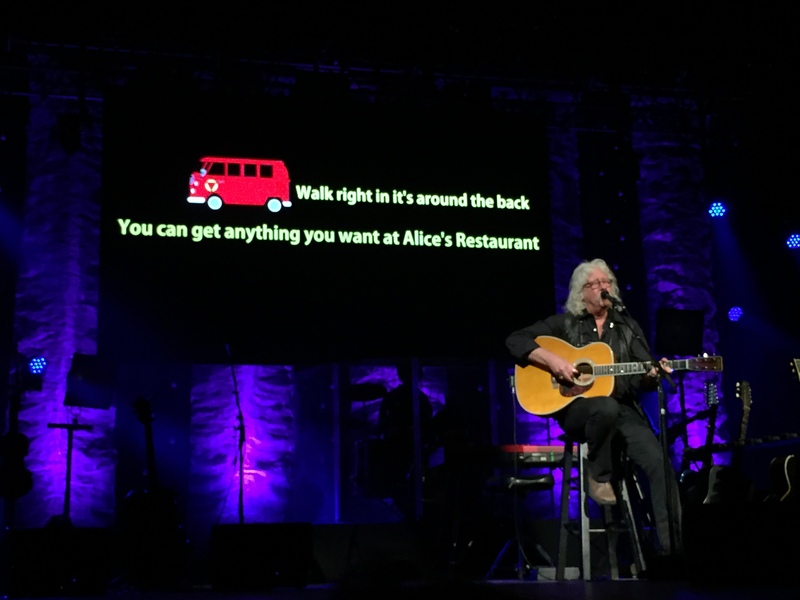 My dream to bring Arlo Guthrie (famous for singing “You can get anything you want at Alice’s Restaurant”) to Ann Arbor started when I was in Florida in January. 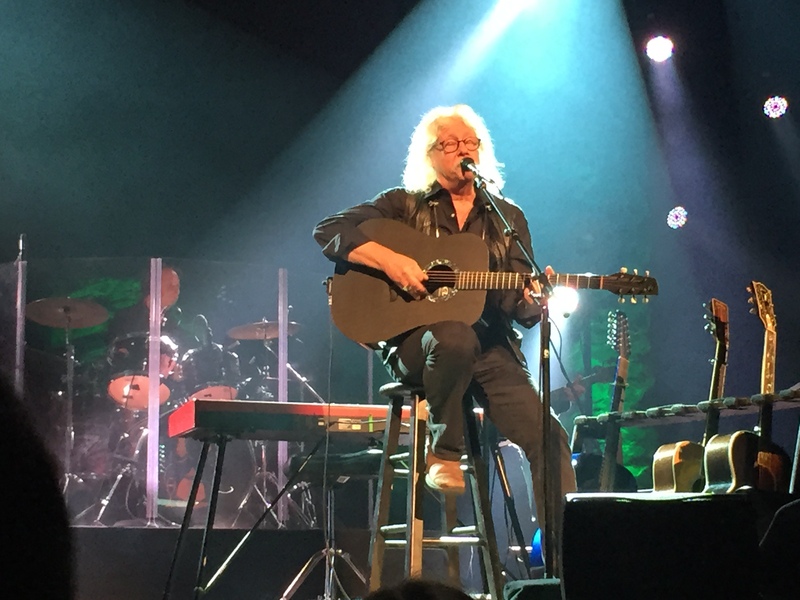 I saw an ad that Arlo was going to be performing at the 500 seat Lyric Theater in Stewart, Florida, but when I called the Lyric to get seats, Arlo was sold out. When the Lyric called me weeks later to offer me two seats in row B off the waiting list, that’s when I said one of the dumbest things I’ve ever said. “I’ll call you right back. I’m going to see if I can find a friend to go with me.” I didn’t have a date because Bob wasn’t in Florida. When I called back ten minutes later, it didn’t matter that I hadn’t found a friend to go with me. Only one ticket was left.I considered myself lucky. When Arlo took the stage the next night, he was wearing all black, highlighting his shoulder-length white hair that curled on its ends like a whisp of smoke. But there was no smokiness in his voice– it sounded nearly the same as in his 1969 recording that I listen to often as I jog. Behind the band (including Arlo’s son on keyboard) was mounted a huge movie screen where we saw a pickle on a motorcycle fly through the air as he sang “I don’t want a pickle. 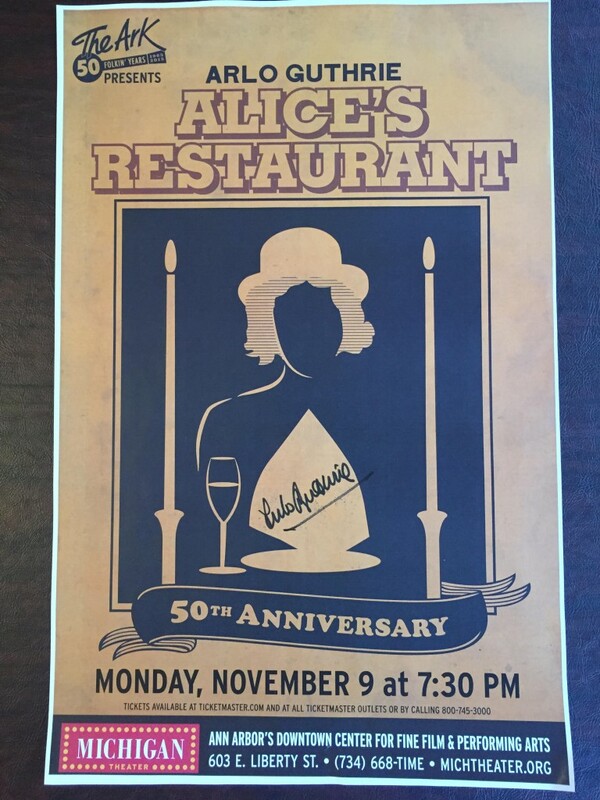 ” The Alice’s Restaurant song opened the second act. How poignant to watch the 19 year old Arlo on the screen from the movie, as 69 year old Arlo sang. “If I knew this song was going to be such as hit, I’d have made it shorter,” he said. 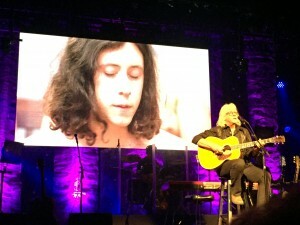 I liked the show so much that I emailed my friend Lee Berry at the Michigan Theater in January to see if he could book Arlo Guthrie in Ann Arbor. 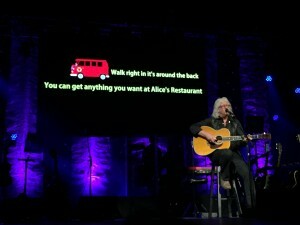 (After all, Arlo only sing’s Alice’s Restaurant in public during these once a decade tours). Lee said he’d have to ask the 400 seat Ark for permission, because they usually host Arlo here. The Ark said “OK,” and with months more of a wait there was finally a date on the calendar! Nov. 9! My dream came true. “Absolutely the best evening I’ve had in a long time,” said one of my friends after the show last night. Although no one motioned to me from stage, I relished my open secret (that I shared with everyone I talked to!) Arlo’s daughter Sarah Lee Guthrie opened the show this time, and it was easy to fall in love with her. Her lithe body swayed in a shimmering dress, and her clever stories and pure voice showed she was her father’s daughter. 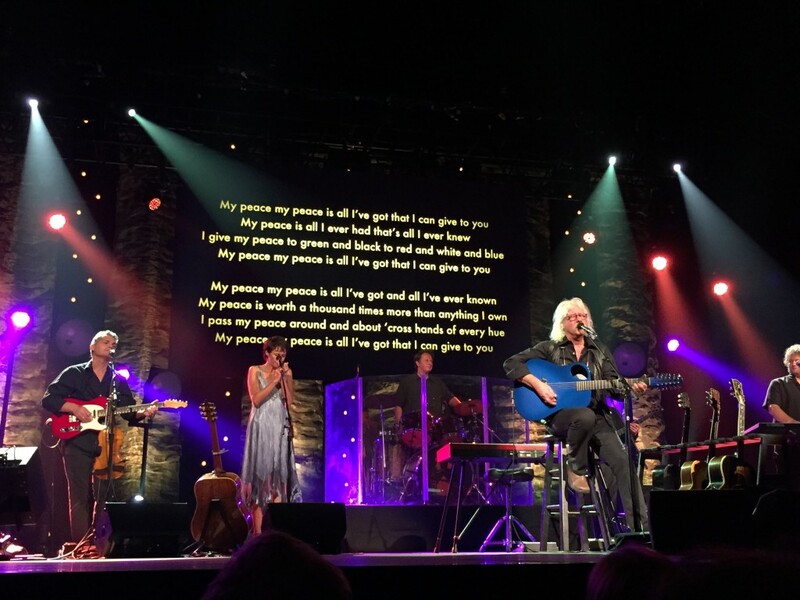 Maybe I hadn’t gotten a friend to go with me in Stewart, but last night I had my husband Bob, and friends Susan, Nan, Steve, Bob W, Cathy and Annie with me, in the audience of 1400 Ann Arborites. Thank you, Lee Berry, The Ark, The Michigan Theater, and Arlo Guthrie and band for making last night so amazing. 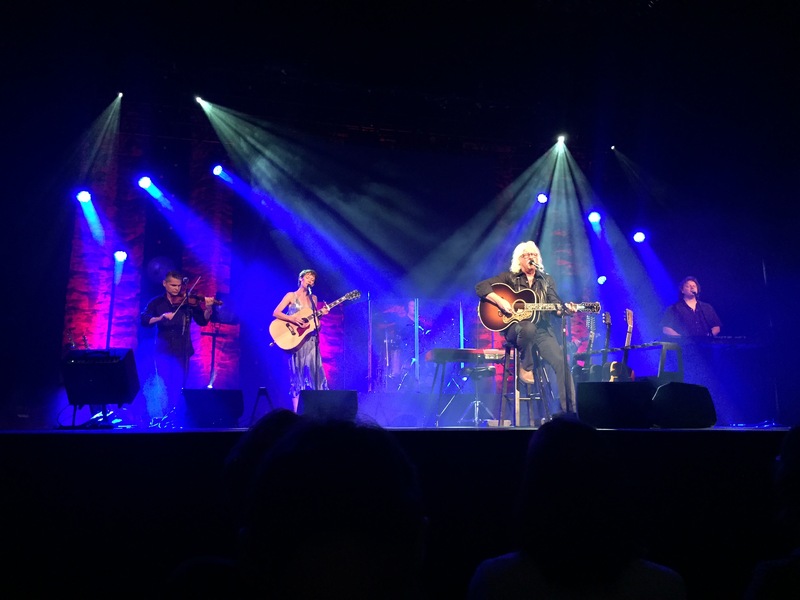 Congrats to both The Ark and Arlo Guthrie for celebrating “50 folkin’ years!” What follows are some more photos from the event.